Alfonso XIII was a Spanish dreadnought battleship, the second member of the España class. She had two sister ships, España and Jaime I. Alfonso XIII was built by the SECN shipyard; she was laid down in February 1910, launched in May 1913, and completed in August 1915. Named after King Alfonso XIII of Spain, she was renamed España in 1931 after the king was exiled following the proclamation of the Second Spanish Republic. The new name was the namesake of her earlier sister ship, the España that served in the Spanish fleet from 1913 to 1923. Alfonso XIII served in the Spanish fleet from 1915 to 1937. Spain remained neutral during World War I, and so Alfonso XIII and her sisters were the only European dreadnoughts to avoid the war. She and her sisters participated in the Rif War, where they provided gunfire support to Spanish Army forces. The ship was seized by General Francisco Franco at the outbreak of the Spanish Civil War. While steaming off Santander on 30 April 1937, she struck a mine and sank; most of her crew was taken off by the destroyer Velasco. Alfonso XIII was 132.6 m (435 ft) long at the waterline and 140 m (460 ft) long overall. She had a beam of 24 m (79 ft) and a draft of 7.8 m (26 ft); her freeboard was 15 ft (4.6 m) amidships. Her propulsion system consisted of four-shaft Parsons steam turbines and twelve Yarrow boilers. The engines were rated at 15,500 shaft horsepower (11,600 kW) and produced a top speed of 19.5 knots (36.1 km/h; 22.4 mph). Alfonso XIII had a cruising radius of 5,000 nautical miles (9,300 km; 5,800 mi) at a speed of 10 knots (19 km/h; 12 mph). Her crew consisted of 854 officers and enlisted men. Alfonso XIII was armed with a main battery of eight 305 mm (12.0 in) /50 guns, mounted in four twin gun turrets. One turret was placed forward, two were positioned en echelon amidships, and the fourth was aft of the superstructure. This mounting scheme was chosen in preference to superfiring turrets, as was done in the South Carolinas, to save weight and cost. Her secondary battery consisted of twenty 102 mm (4.0 in) guns mounted in casemates along the length of the hull. They were too close to the waterline, however, which made them unusable in heavy seas. She was also armed with four 3-pounder guns and two machine guns. Her armored belt was 203 mm (8.0 in) thick amidships; the main battery turrets were protected with the same amount of armor plate. The conning tower had 254 mm (10.0 in) thick sides. Her armored deck was 38 mm (1.5 in) thick. Alfonso XIII was laid down at the Sociedad Española de Construcción Naval shipyard in Ferrol on 23 February 1910. She was launched on 7 May 1913, and completed on 16 August 1915. After their completion, Alfonso XIII and her sisters, España and Jaime I, the three battleships formed the 1st Squadron of the Spanish fleet. Spain remained neutral after the outbreak of World War I in August 1914, so Alfonso XIII and her sisters were the only European dreadnoughts to avoid the war. In August 1917, Alfonso XIII assisted in the suppression of general strikes in Vizcaya and Bilbao. After the end of the war, Alfonso XIII conducted cruises to show the flag, including a visit to Annapolis, Maryland, in 1920, during which USS Reina Mercedes, a former Spanish Navy cruiser captured by the United States during the Spanish–American War in 1898, flew the Spanish flag to honor her visit. Throughout the early 1920s, she provided fire support to the Spanish Army in its campaigns in Morocco during the Rif War. On 17 September 1921, she and España bombarded Rif positions south of Melilla while Spanish Foreign Legion troops assaulted the positions. In August 1923, she participated in the first aerial, naval, and land combined arms operation in Spanish military history. In September 1925, she provided fire support for the Al Hoceima landings, a decisive Franco-Spanish operation; there, she served as the flagship of the Spanish naval contingent. In April 1931, after the advent of the Second Spanish Republic, Alfonso XIII became part of the Spanish Republican Navy and was renamed España, the name previously held by her sister ship España, which had been wrecked in 1923 while engaged in combat operations at Cape Tres Forcas. By 1934, the renamed España was laid up at Ferrol awaiting disposal. That year, the Spanish Navy considered rebuilding the ship and Jaime I into analogues to the German Deutschland-class cruisers, with new oil-fired boilers. The ships' hulls would have been lengthened, and the main battery turrets rearranged so they would all be on the centerline. The ships' secondary batteries would have been replaced with dual-purpose 120 mm (4.7 in) guns. The plan was nevertheless abandoned. In 1936, the Navy again proposed a modernization for the two ships. It was a less radical plan, and called for additional anti-aircraft guns, modern fire control equipment, oil-fired boilers, and an increase to the elevation of the main guns. At the time of General Francisco Franco's coup in July 1936 the battleship was still laid up in Ferrol. As detachments of the army, including some coastal artillery units around the harbor, sided with Franco's Nationalists, sailors who supported the Republican government took control of the ship with the intent of resisting the coup. 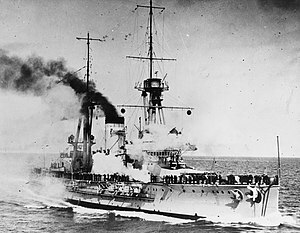 Along with the crew of the cruiser Almirante Cervera, España engaged in an artillery duel with the shore batteries and the Nationalist-controlled destroyer Velasco. The engagement lasted several days and resulted in considerable destruction in the harbor, while Velasco was also heavily damaged before the crews of España and Almirante Cervera were convinced to surrender. España was then refitted and fought on the Nationalist side in the Spanish Civil War, operating as part of a naval task force along with Almirante Cervera and Velasco, which captured or drove back a number of Republican and foreign merchant ships. España seized the Republican freighter Mar Báltico with a cargo of iron ore on 13 February 1937, and on 30 April she prevented the entry of the British steamer Consett to Santander by firing her main guns across the freighter's bows. According to Nationalist sources the Consett and other blockade-runners were escorted at the time by the destroyer HMS Forester. Later that day the España accidentally struck a mine laid by her own side and sank three hours later off the coast near Santander, while assisting the destroyer Velasco in turning away the British merchantman Knistley. While the ship was sinking, Republican aircraft attacked her. All her crew, with the exception of five seamen, were rescued by the Velasco. ^ "Reina Mercedes". Dictionary of American Naval Fighting Ships. Navy Department, Naval History and Heritage Command. Retrieved 7 July 2013. Alvarez, Jose (2001). The Betrothed of Death: The Spanish Foreign Legion During the Rif Rebellion, 1920–1927. Westport, CT: Greenwood Press. ISBN 0313073414. Beevor, Antony (2000) . The Spanish Civil War. London: Cassell. ISBN 0-304-35281-0. Cabrera, Mercedes; Reguillo, Fernando del Rey (2007). The Powers of Entrepreneurs: Politics And Economy in Contemporary Spain. New York, NY: Berghahn Books. ISBN 9781845451851. Fernández, Carlos (2000). Alzamiento y guerra civil en Galicia: 1936–1939. Volume 1. Sada, Galicia: Ediciós do Castro. ISBN 84-7492-951-2. Fitzsimons, Bernard, ed. (1978). "España". The Illustrated Encyclopedia of 20th Century Weapons and Warfare. 8. Phoebus Publishing: London. pp. 856–57. Gibbons, Tony (1983). The Complete Encyclopedia of Battleships and Battlecruisers: A Technical Directory of the World's Capital Ships From 1860 to the Present Day. London: Salamander Books, Ltd. ISBN 0861011422. Garzke, William H.; Dulin, Robert O. (1985). Battleships: Axis and Neutral Battleships in World War II. Annapolis, MD: Naval Institute Press. ISBN 978-0-87021-101-0. Heaton, Paul Michael (1985). Welsh Blockade Runners in the Spanish Civil War. Risca, Newport: Starling Press. ISBN 0-9507714-5-7. Moreno de Alborán y de Reyna, Salvador (1998). La guerra silenciosa y silenciada: historia de la campaña naval durante la guerra de 1936-39. Volume 3. ISBN 84-923691-0-8. "Proceedings of the United States Naval Institute". 66. Annapolis, MD: United States Naval Institute. 1940. Roskill, Stephen (1976). Naval Policy Between the Wars, Volume 1. London: Collins. ISBN 0-00-211561-1. Launching of the battleship Alfonso XIII - 1913 silent newsreel footage from the Filmoteca Española. This page was last edited on 7 August 2018, at 02:10 (UTC).